Alex has an obsession with all things creepy, and he spends his nights writing scary stories. One night he decides he’s tired of being a “weirdo,” so he sneaks out of his family’s apartment with his story notebooks and heads to the basement to burn them in the building’s boiler. The elevator takes him to a different floor instead, where he is illogically lured into a strange apartment and soon finds himself trapped in an actual scary story, enslaved by an actual witch. It turns out the witch needs his stories to keep the enchanted apartment under control, and although he wants to find a way to escape there is a part of him that enjoys the dark, magical surroundings and the appreciative new audience for his tales. Can he keep creating new horror stories to keep the witch happy, or can he figure out a way to use his storytelling as his means of escape? This isn’t the creepiest middle grade fiction book I’ve ever read, but with its dark fairy tale elements it brings just the right amount of horror, tinged with hope and humor, for young readers. I loved how this book not only spun a good tale but made me think about the power of storytelling, and, quite simply, made me want to write things. I think young readers will recognize and engage with these themes of storytelling, writing, and being true to one’s interests and talents as well. The story also explores friendship/relationship-building rather well, as Alex and Yasmin (another child enslaved by the witch) learn to trust, help, and open up to each other despite the very real possibility of getting separated or hurt by the manipulations of the witch. This novel would be a perfect next step for fans of scary story collections. The text does an excellent job of integrating many such scary stories, written by Alex, into the larger narrative framework. I especially liked the inclusion of fully-readable pages from books in the witch’s library, complete with secret handwritten notes in the margins. It is a low-key metafictional touch that isn’t too gimmicky and does subtle wonders for the setting, making the witch’s vast library of scary stories seem tangible. They are teasers for a whole world of other books to explore. Highly recommended for budding writers (which ideally would be any young person) and fans of scary stories and fairy tales, whether fractured, Disneyfied, or traditionally dark. 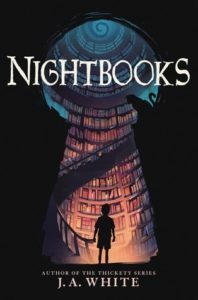 It could make a good read-alike for Neil Gaiman’s middle grade books, Adam Gidwitz’ A Tale Dark and Grimm series, Frank Cole’s Potion Masters series, and for those who enjoy the creepier aspects of Harry Potter. It would be a great step towards more literary/Newbery-ish dark fantasy books such as The Girl Who Drank the Moon, Splendors and Glooms, or Jonathan Auxier, as it has similar moods and themes but reads slightly easier and younger than those books.